The You Tube video above is a selection of folk dances from the repertoire of the folk dance group la Pastourelle d’Auvergne de Romagnat. I’m listening and watching to get myself better into the rhythmic mood of the song I’m going to be singing in concert tomorrow night. The song’s much slower, but it’s in 6/8 time (like the Viennese Waltz) and the first dance at least in this video is in 6/8 time (you can do a Viennese Waltz to the tempo). Musical theorists, put me right if I’m wrong here! I’ve only about 24 hours to fix this problem! I found I wasn’t so nervous at last night’s rehearsal – singing in the midst of a throng of folk suffering various degrees of nerves (or none, in some cases) – so my writing method of handling my performance nerves may have been a good idea! It’s been suggested I write a book about it to share with other students! Why not? I might just do that. The rehearsal wasn’t a complete success and I found myself at 4 this morning, on the computer, checking out 6/8 time, then whistling my song to myself while dancing around the sitting room, Viennese-Waltz fashion. This morning I’ve been through my sheet music and put the timing of each and every note above it in pencil. I’ve got to spend the rest of my time before performing tomorrow, tweaking the rhythm of my singing. Luckily, I’ve a selection of metronomes on my iPad to help me along! It’s clearly advantageous to be multi-disciplinarian in the arts. In my teens, I went to classes to learn all the Ballroom and Latin American dances. This came in handy when doing ice dance in my 20s. Now it’s handy for singing in my 60s! I was a bit deflated after the rehearsal. If you’re British, you will certainly be familiar with the hugely successful UK TV comedy sitcom of the 80s, Only Fools and Horses. 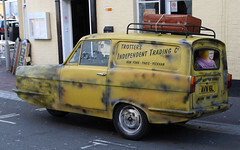 The lead character is Del Trotter (Del Boy) – actor Sir David Jason – a heart-of-gold wheeler and dealer of goods which he’s not always come by strictly legally. Managing director of Trotter’s Independent Trading, which shortens to T.I.T.S. Here’s a photo of the company car. Del’s also socially ambitious, though his attempts to climb the social ladder always meet with ludicrous failure. If you’re a fan (and who in the UK isn’t?) you’ll need no introduction to the famous episode (Yuppie Love) when Del takes his brother Rodney – actor Nicholas Lyndhurst – to a wine bar and at one point, goes to lean his elbow (pseudo-nonchalantly) on a bar flap. Del hasn’t noticed that the flap’s been raised only seconds before (the slapstick-type timing in this is impeccable). Well, that’s a bit like how my rehearsal went. It seems I’d picked the only piece of music to sing that my brilliant and massively experienced accompanist had never come his way before. While he was trying to learn the tune as he played, I was trying to find a way of following his playing. The result resembled something like a zombie lurching back to his grave after a night on the town. I learnt the lesson that you don’t lean on the piano player – especially when he’s trying to figure out the tune and rhythm himself! It’s exactly like leaning on a bar flap that isn’t there! The dance troupe also performs a dance in which the women are wearing their dresses back to front. Apparently this was a custom of the region in bygone days. I haven’t been about to find out why, though it’s been suggested that it’s something to do with la Reine Margot (Margot de Valois, sister of Charles IX) who was forced into a marriage with King Henri of Navarre and planned to run away with a lover. Why would she wear her dress back to front? It’s said that it’s because, almost caught in flagrante delicto with her lover, she put her frock back on in haste, and therefore back to front. I once went to work with a dress on back to front. Sad, sad, sad. Have a nice day. Me, I must get back to my Viennese Waltz and metronome. This entry was posted in Inspiration, Music, Singing and tagged Charles X, David Jason, Del Boy, La Pastourelle, LA REINE MARGOT, Margot de Valois, NaBloPoMo, Nicholas Lyndhurst, Only Fools and Horses, performance nerves, performing, Singing, Viennese-Waltz. Bookmark the permalink.